The works presented in Michalis Pichler’s catalogue Books and Ideas after Seth Siegelaub reinvent Siegelaub’s renowned distinction between primary and secondary information. This anthology provides a welcome overview of the highly innovative exhibition and distribution practices developed by Seth Siegelaub in the late 1960s and the 1970s. 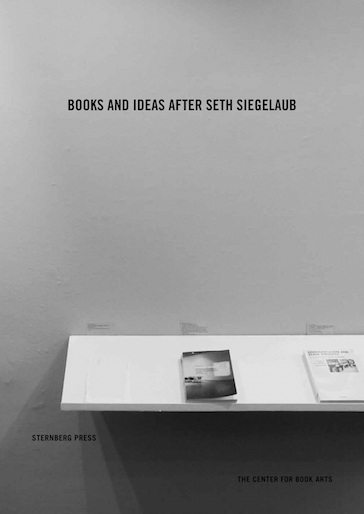 Seth Siegelaub was largely responsible for publicizing and promoting Conceptual art in the 1960s, but as Books and Ideas documents, he has continued to be a provocation and inspiration almost half a century after his abrupt exit from the art world he helped to create. Moreover, this book provides a context for Pichler’s own brand of conceptual practices. If part of Siegelaub’s genius was to reconceive exhibition as publication, Pichler gives us a catalogue of catalogues exhibiting the proliferation of mirrors which line the hall of Conceptual art’s legacy. In the pages of Books and Ideas, secondary information, accordingly, becomes primary.